You will be given a Free reference e-book to read which has 286 pages And the test will be based on that e-book. IBM offers network integration services that are extremely useful in creating a more powerful network that give your IT infrastructure an easier time adapting to the quickly changing needs of the business industry especially in terms of technologies. The usual services offered by IBM involve those that can be used in planning, designing, deploying, managing and monitoring networks while also providing easier access to all data and applications that are essential in meeting the specific requirements of the business industry. The good thing about IBM is that it is capable of effectively supporting the newest business models with the help of the most flexible networks that are capable of improving their ability to respond rapidly to changes. IBM also supports the increasing number of different types of devices, networks and users. It works in preventing issues related to networks that may hamper the ability of business processes to provide the most efficient results. 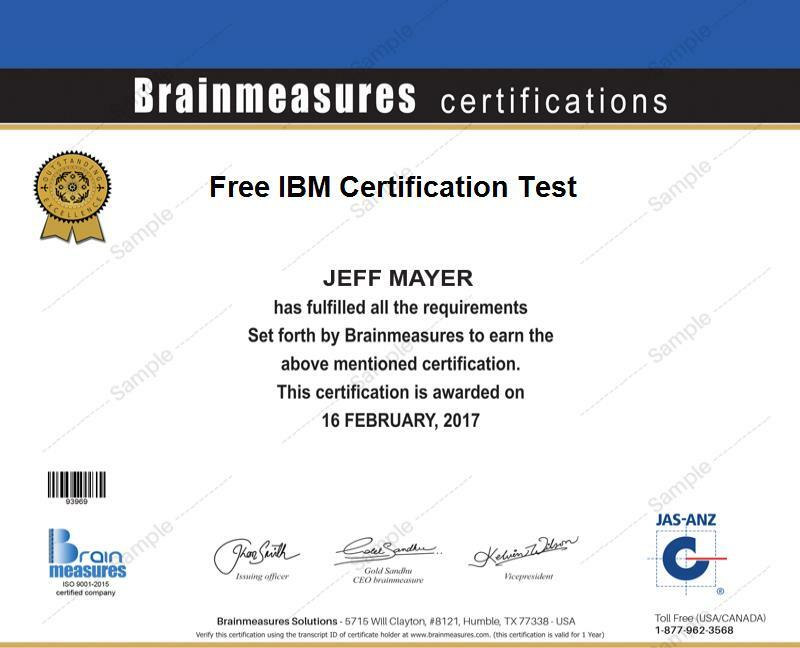 The good thing about deciding to become an IBM expert is that you can now access the free IBM certification practice course which is developed by Brainmeasures and offered to the public. This free practice course also has its own free study guide and IBM practice test necessary in preparing you towards taking up the online certification exam designed for aspiring IBM professionals. With the help of this free IBM practice course, you can easily deal with all the challenges linked to taking up the exam, thereby boosting your chances of becoming a certified expert. The free IBM certification practice course offered by Brainmeasures is definitely your ticket towards being able to successfully handle all the complexities linked to taking up the certification exam. This free practice course boasts of its well-detailed and free study guide guaranteed to cover all aspects related to using IBM including its capabilities, major functions, importance and how you can efficiently implement its major applications and programs. A free practice test is also included in this course and this is a major help when trying to get a feel of the actual exam. This makes it easier for you to pass it and finally receive your IBM certificate. How to register for the certification exam? How to effectively address and route a network? How to effectively start and stop a network and its subsystems? How to efficiently control sub-servers? The free IBM practice certification course offered by Brainmeasures is mainly intended for all those who plan to pass the IBM certification exam and transform themselves into one of the best certified experts in using IBM. It is capable of providing more benefits to all aspiring IBM administrators, engineers, consultants, managers and anyone who dreams of taking full advantage of the IBM network and use it to improve their business operations. You will also enjoy more financial stability upon receiving your IBM certification because it gives you the chance to earn higher. It lets you work as an IBM network consultant and earn up to $115,000 yearly. Your decision to use your certification to work as an IBM network manager is also very rewarding since it gives you the opportunity to earn around $73,000 to $130,000 every year.